Thanks to Eric Jacobson of the Battle of Franklin Trust for sending along this image of the GHS’s new marker interpreting Patrick Cleburne’s plan to arm slaves for the Confederate army. 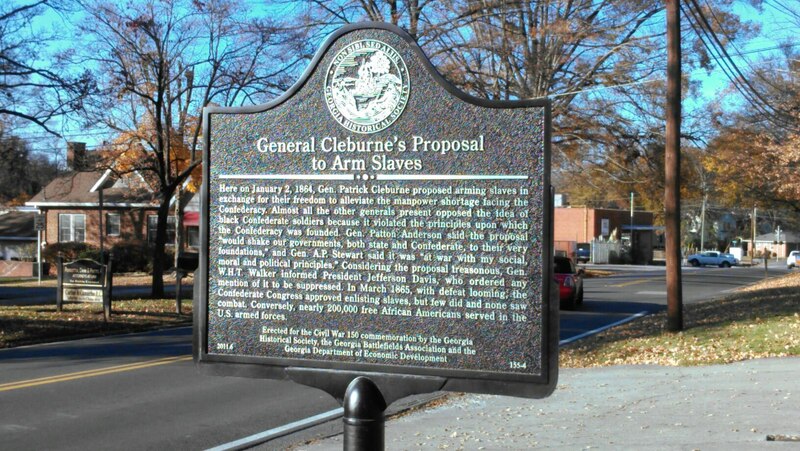 This should give you some things to think about as you compare this marker with that of the Georgia Historical Commission’s which I posted earlier today. I shared a short video of the marker’s dedication back in 2011. Given my criticisms re: the GHC’s text you can probably surmise which one I prefer. How about you? What goes into an effective historical marker? Good, though it should have noted Cleburne’s status as an immigrant which may have given him less of an investment in the heritage of slavery. Cleburne only arrived in the South as a young man, having grown up in Ireland and having served in the British army. Judah P. Benjamin was an immigrant too. Yet, he was invested in slavery and the Confederacy. Jefferson Davis apparently didn’t really disagree with Cleburne’s proposal. He understood the political ramifications of it and therefore suppressed the proposal, but as a practical matter he wasn’t necessarily against it. Division and Corps level Generals Hardee, Cheatham, and Hindman all declared or signed in support of the document. And although Cleburne was not ever promoted to Corps command, Cheatham who out ranked him in their Corps, was promoted to Corps command as endorsed by Hardee. Some Confederates were beginning to think of a Confederacy without slaves maybe. Not sure of your point Lyle. Benjamin was 2 when his parents brought him from St. Croix, which had slavery, to North Carolina which had slavery. He later moved to South Carolina, also a slave state. As a teenager, he moved to New Orleans, a center of slavery in the lower south, and he owned slaves as a young man. My point was not that being born outside the U.S. makes someone an abolitionist. My point is that I’m not sure how much Cleburne being an immigrant contributed to his proposal. Cheatham, for example, was a native born slave owner (or had been) and he signed the proposal (one of 14 Generals and Colonels – some of whom most have also owned slaves). I don’t disagree with you that many immigrants weren’t invested in slavery. Most weren’t. And I think it’s a fair question to ask about Cleburne. I’m just not convinced it had anything to do with it, although I concede that it might have. I’ll look into a bit more. It strikes me that he was the only Maj. or Lt. General in the Confederacy born and raised in another country, if I recall correctly, and the only man of that high rank to try to organize others to pursue what was a radical proposal. Recall that this was more than idle camp chatter. The fact that other men joined him after he made the proposal does not diminish his unique position. Camille de Polignac, who was French, was also a Major General. There were a couple of other foreign born/immigrant Brigadier Generals, like Collet Leventhorpe and Joseph Finegan. I think the fact that others in camp were convinced by Cleburne, or agreed with him and encouraged him, diminishes how unique an argument it was. This New York Times article suggests there were earlier arguments of arming of slaves before Cleburne’s proposal. You can find calls as early as 1861 for the arming of slaves. Richard Ewell was one of the earliest advocates. I think I’ve read about Ewell before or some others. It’s not easy to quickly find a source on the internet. I don’t know much about De Polignac and why exactly he became a Confederate, other than he was in New Orleans or south Louisiana at the time of secession. His French political views may have helped sway him. Cleburne himself said that he joined up because Southerners had treated him well as an immigrant; in other words he went along with his friends without necessarily sharing their motivation. But did Cleburne fail to appreciate the sentiments of Confederate White Southerners; or was it the case that, in spite of Confederates having taken up arms for slavery and nothing else, after 4 years of war a Confederate patriotism had developed that was even prepared to give up slavery to save the Confederacy? A quite interesting counter-example to the claim that immigrants’ non-American background determined their attitudes to American issues is the case of the two Young Ireland leaders Thomas Meagher and John Mitchel (refugees rather than immigrants, perhaps). Although their careers were nearly identical until they were rescued from exile in Tasmania and brought to the United States, Meagher became a Union general while Mitchel became a slave-owner and a particularly virulent Confederate. Just to be clear, I don’t believe that being an immigrant determines anyone’s attitude on anything. However, I have spent a lifetime working in immigrant communities and have found that immigrants who come to the US as adults, as Cleburne did, find themselves in societies where the accepted wisdom of the receiving community (in this case, the slaveholding south) is not immediately apparent to them. The adult immigrant then may accept, reject, or modify with a fluidity that is more difficult for someone who grew up under the system and was inculcated from birth with it to achieve. For Cleburne to advocate for limited emancipation, he did not have to turn his back on everything he had been told by those he loved and respected since he was a child. This does not only apply to immigrants in the South. Many German immigrants in Missouri who joined the Republican party had a very different point of view on the GOP than their native born neighbors who joined the same party. Seems folk leave that comment out when they talk of Cleburne’s proposal. It might be interesting to compare the perspective of a well-documented immigrant like Cleburne with the perspectives of two other well-documented immigrants, Henry Wirz and Henry Morton Stanley, who also, at least initially, signed on with the Confederacy. Didn’t all three of them enter the U.S. through the port of New Orleans?